Minister of Foreign Affairs: Hon. Tilak Marapana, M.P. Politics of Sri Lanka takes place in a framework of a semi-presidential representative democratic republic, whereby the President of Sri Lanka is both head of state and head of government, and of a multi-party system. 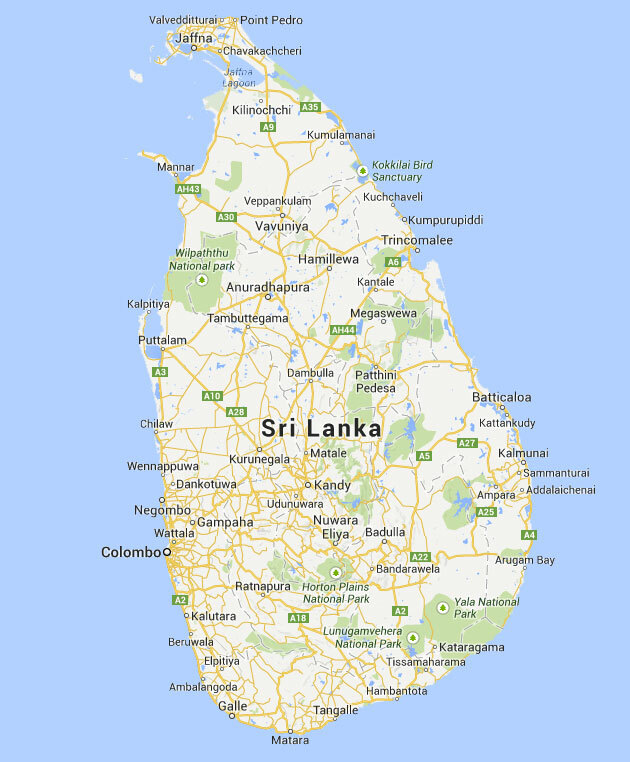 Sri Lanka, formerly Ceylon, is an island lying in the Indian Ocean and separated from India by the Palk Strait. It is located between latitudes 5°55′ and 9°51′ N and longitudes 79°41′ and 81°53′ E and has a maximum length of 268 miles (432 km) and a maximum width of 139 miles (224 km). Proximity to the Indian subcontinent has facilitated close cultural interaction between Sri Lanka and India from ancient times. At a crossroads of maritime routes traversing the Indian Ocean, Sri Lanka has also been exposed to cultural influences from other Asian civilizations. Ancient Greek geographers called it Taprobane. Arabs referred to it as Serendib. Later European mapmakers called it Ceylon, a name still used occasionally for trade purposes. 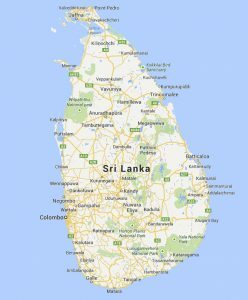 Geologically, the island of Sri Lanka is considered a southerly extension of peninsular India, with which it shares a continental shelf and some of its basic lithologic and geomorphic characteristics. Hard, crystalline rock formations, such as granite, gneisses, khondalite (a type of metamorphic rock) and quartzite, make up about nine-tenths of the island’s surface and subsurface. A roughly triangular mountainous area in the island known as the Central Highlands occupies the south-central region and is the heart of the country. This highland mass is surrounded by a diverse plain, the general elevation of which ranges from sea level to about 1,000 feet (300 meters). This plain accounts for about five-sixths of the country’s total area. The Central Highlands have a highly dissected terrain consisting of a unique arrangement of plateaus, ridges, escarpments, intermountain basins, and valleys. Sri Lanka’s highest mountains – Pidurutalagala (8,281 feet 2,524 meters), Kirigalpotta (7,858 feet), and Adam’s Peak (Sri Pada; 7,559 feet) are found in this area. The highlands, except on their western and southwestern flanks, are sharply defined by a series of escarpments, the most spectacular being the so-called World’s End, a near-vertical precipice of about 4,000 feet. The plain that surrounds the Central Highlands does not have an entirely flat and featureless terrain. To the north and northeast of the highlands, the plain is traversed by low ridges that decrease in altitude as they approach the coast. The western and southwestern parts of the plain feature alternating ridges and valleys running parallel to the coast and increasing in elevation toward the interior to merge imperceptibly with the highland mass. Elsewhere the flatness of the plain is sporadically interrupted by rocky buttes and mounds, some of which reach elevations of more than 1,000 feet. The plain is fringed by a coast consisting mostly of sandy beaches, spits, and lagoons. Over a few stretches of the coast there are rocky promontories and cliffs, deep-water bays, and offshore islets. The surface drainage of Sri Lanka is made up of about 100 “rivers,” most of which are mere wet-season rivulets. Twelve major rivers account for about 75 percent of the mean annual river discharge of the country, with those that flow entirely through the Wet Zone (the highlands and the southwestern part of the country) carrying about half the total discharge. With the exception of the 208-mile-long Mahaweli River, all major rivers flow radially from the Central Highlands to the sea. The Mahaweli, which originates on the western slopes of the highest areas of the highlands, follows a circuitous route in its upper reaches before it enters the plain to the east of the highlands and then flows toward the northeast coast. Because a part of its catchment is well within the Wet Zone, this river has a larger and less seasonally varied flow than the other Dry Zone rivers and so is a major asset for irrigation in the drier parts of the country (the Dry Zone includes the northern part of the country and much of the east and southeast. Sri Lanka’s natural vegetation covers about one-third of the total land area. The climax vegetation (i.e., natural vegetation permitted to develop uninterrupted) in most parts of the country is forest. In the Wet Zone, tropical wet evergreen forest dominates in the lowlands, and submontane and montane evergreen forests prevail in the highlands. The Dry Zone has a climax vegetation of dry evergreen forest and moist deciduous forest, with forests giving way to stunted, shrubby, xerophytes (drought-tolerant) vegetation in its driest parts. In the highest areas of the Central Highlands, forests tend to be sparse and interspersed with grasslands. Most of Sri Lanka’s climax vegetation cover has been heavily depleted by extensive clearing of forests for settlements, extraction of timber, and agriculture. Only the Sinharaja forest and the Peak Wilderness of the southwestern interior remain as significant remnants of the Wet Zone’s original evergreen forests. The forests found in most parts of the Dry Zone are secondary vegetation, which probably developed after hundreds of years of repeated clearing and cultivation. The virgin forests of Sri Lanka are rich in their variety and profusion of flora and fauna. Wildlife, including elephants, leopards, bears, buffalo, and peafowl, and tree species such as ebony, mahogany, satinwood, and teak are being rapidly depleted by indiscriminate exploitation. Sri Lanka’s tropical location ensures perennially high temperatures, with monthly averages between 72 °F (22 °C) and 92 °F (33 °C) in the lowlands. In the Central Highlands, higher altitudes account for lower temperatures, with monthly averages between 44 °F (7 °C) and 71 °F (21.6 °C). Rainfall is the conspicuous factor in the seasonal and diurnal variations of the climate of Sri Lanka. Most parts of the country receive an average annual rainfall of more than 50 inches (1,270 mm). However, regional differences in the amount of rain, its seasonality, and its variability and effectiveness have formed the basis of a distinction in Sri Lanka between a Wet Zone and a Dry Zone. In the former area, which covers the southwestern quadrant of the island (including the highlands), the rainfall is heavy (annual averages range from 98 inches along the coast to more than 150 inches in the highlands) and seasonally well distributed (although a greater part of the rain comes from the southwest monsoon from May to September). Rainfall deviates relatively little each year from the annual averages and is effective enough to maintain soil moisture and surface drainage throughout the year. Over the rest of the island – the Dry Zone -annual totals of rain range from 30 to 70 inches in the different areas (much of it being received during the northeast monsoon season from November to January). Droughts that persist for more than three months are common. The distinctive civilization of Sri Lanka, with roots that can be traced back to the 6th century B.C., is characterized by two factors: the preservation of Theravada Buddhism (the orthodox school of Buddhism having its literary traditions in the Pali language) and the development over two millennia of a sophisticated system of irrigation in the drier parts of the country. This civilization was further enriched by the influences of Hinduism, Islam and more recently by Christianity. In 1948, after nearly 150 years of British rule, Sri Lanka became an independent country, and it was admitted to the United Nations seven years later. The country is a member of the Commonwealth and the South Asian Association for Regional Cooperation. Colombo , which emerged as the main urban center during British rule, remains the executive and judicial capital of Sri Lanka; Sri Jayewardenepura Kotte, a Colombo suburb, is the legislative capital. For administrative purposes, the country has been divided into nine provinces and subdivided into 25 districts. Sri Lanka is densely populated. The majority of its people lives in rural areas, and depends on agriculture for their livelihood. A physical environment of wide-ranging diversity makes Sri Lanka one of the world’s most scenic countries. As the home of several ethnic groups, each with its own cultural heritage, Sri Lanka also has a highly varied cultural landscape. Economy: Sri Lanka’s most dynamic sectors are food processing, textiles and apparel, food and beverages, port construction, telecommunications, and insurance and banking. In 2006, plantation crops made up only 15% of exports (90% in 1970), while textiles and garments accounted for more than 60%. About 800,000 Sri Lankans work abroad, 90% of them in the Middle East. They send home more than US$1 billion a year. Additional information: please refer to Sri Lanka Government institutions at links below.